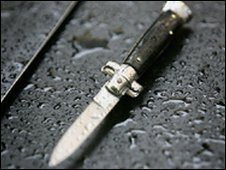 A Scotland-wide service aimed at tackling knife crime will enable people to pass on information via text message about people carrying weapons. The Crimestoppers initiative, which is being launched in Aberdeen, uses hi-tech software that guarantees the sender's anonymity. The information is passed on using the special hotline number 88551. Crimestoppers piloted the service in London where it was hailed a success by both police and young people. During the period from August last year to March, the number of pieces of actionable information relating to knife crime in the city trebled. Michelle Herd, Crimestoppers project organiser for Grampian, Tayside and Highlands and Islands, said: "Knife crime is a serious issue. "Texting Crimestoppers is a simple way you can help combat it and keep safe. We do not trace text messages or your mobile number, so no-one will ever know you passed on information." Grampian Police Chief Constable Colin McKerracher said: "This text messaging service offered by Crimestoppers gives people the opportunity to anonymously provide information on any person, whatever their age, who they know is carrying or has used a knife. "It's an excellent opportunity for the public to be proactive in the prevention of crime."